Young readers of this eventing thriller might not know that the author is channelling Rocky Balboa but the guiding hand that led him to success is there for Casey too, if only she can rise to the occasion. Casey Blue has just won at Badminton with her One Dollar horse, Storm, an ex-racehorse found in a knackers yard and turned into eventing wonder horse by Casey and her coach Mrs Smith. Now she has a crack at Kentucky Three Day Event. But her dad is suddenly charged with manslaughter during a robbery gone wrong. Sadly he’s a former criminal, but surely he learned his lesson in prison, didn't he? He couldn’t have done this in the most important week of young Casey’s life? With her father locked away, Casey can’t concentrate, her horse Storm seems to reject her, she loses her boyfriend Peter and everything is going wrong all at once. Mrs Smith takes things in hand and gets Casey to meet a boxer. Before you know it she’s eating raw eggs and doing sit-ups bouncing on an exercise ball – all a la Rocky and what this has to do with horse-riding she has no clue, but she does know it hurts a LOT. Then Casey gets a blackmail note. 'You have to WIN in Kentucky or your Dad is going down for life'. The stakes are high. 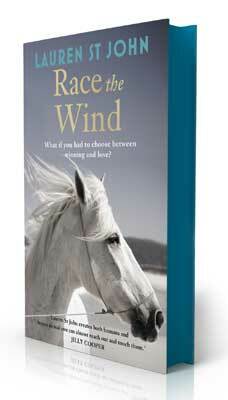 Race the Wind is a perfect thrill for any girl who loves riding and eventing and after watching the Olympics in Greenwich last summer, everyone now knows there is a great deal of skill involved. Storm she knows can do it - but Casey's a mess inside her head now and she's not sure who to trust. Can Casey make it to Kentucky and win to save her father? It all depends on Storm.